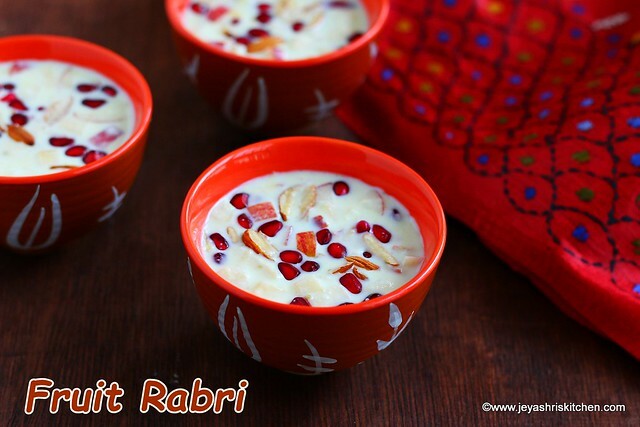 Fruit Rabri recipe| Fresh fruit rabri, a delicious Indian sweet | dessert made with milk and fresh fruits. Rabri can be made using condensed milk also. I have first tasted fruit rabri in a surprise birthday organised by my friends for my birthday last year. It tasted so good and i wanted to try this at home. Finally i thought i will post today as Holi 2018 is celebrated tomorrow March 1. Rabri is a popular and exotic Indian dessert. Generally rabri is served with Jalebi, Gulab jamun,shahi tukda and many more. 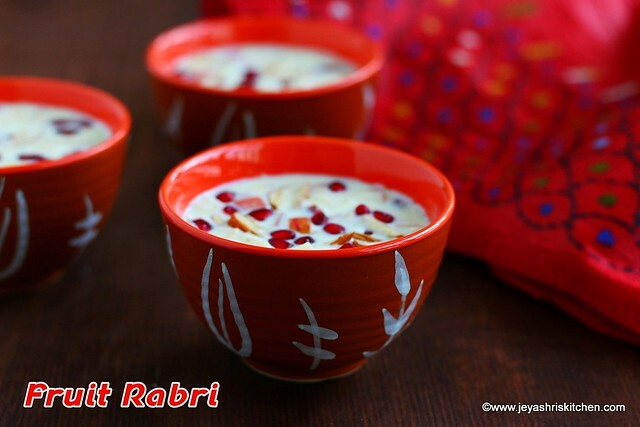 Try this fruit rabri at home and Happy Holi to you all. *I used pomegranate and apple. You can use pineapple, grapes and mango too. In a heavy bottomed pan, add the milk. Boil the milk in a medium low flame. You can a keep a ladle on the top of the pan as shown in the picture,to avoid the milk from over flowing. Stir the milk in between frequently. Once the milk starts reducing, mix the corn flour with 2 tblsp room temperature milk without any lumps. Let this boil for some time, till the milk reduces little and thickens. After adding the corn flour the milk mixture may get burnt so take care and stir continuously. Add the milk masala to this. If you do not have milk masala,add a pinch of cardamom. Add the pinch of saffron. Mix well. Allow this to cool completely. You can add dates,raisins,and other dry fruits like pistachios,Chironji etc. 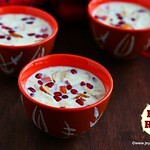 Always add the fruits when the rabri is completely cool,else it will ooze out water. Do not add the corn flour more than the quantity mentioned. Use full cream milk for best results. You can add skip sugar and add 1/4 cup of Condensed milk to the rabri.